Once a North East favorite, popular restaurant The Cork 1794 recently reopened in the West Erie Plaza, featuring a sleek, cosmopolitan feel that is atypical for Erie. But does the food match the swanky atmosphere? There lie inherent risks in the relocating and reopening of a restaurant. Patrons will look for favorites of the past, mourning the losses of delicious dishes left off of the menu to create room for new experimentation. Conversely, patrons will look for rejuvenation through innovation. What's updated? What's new? Are there notable improvements necessary to truly celebrate the new launch of an already successful venue — or is this a cut-and-paste job merely to capitalize on a better location? Red Letter Hospitality, owners of The Cork, have struck a nice balance of the familiar and the novel with its reopening in the West Erie Plaza. And the move makes good sense for Red Letter and for the community. North East, the previous hometown of The Cork, gained The Skunk & Goat, a funky (in a good, fun way!) take on an American tavern-style bar and restaurant, with The Cork's heeding of the call to "go west, young restaurant!" The Cork, which opened in North East just four years ago, now finds itself bottled (only wine-based pun in this review, promises its author) between Erie County's most populated municipalities, the City of Erie and Millcreek. Situated just west of Pittsburgh Avenue in Millcreek, the new Cork is more accessible to a higher concentration of locals and passersby traveling off of I-79. Inside, the restaurant's sleek cosmopolitan feel is dashing yet inviting without being overwhelming. With what one might assume to be no offense to Erie, it's easy to think "this isn't Erie." 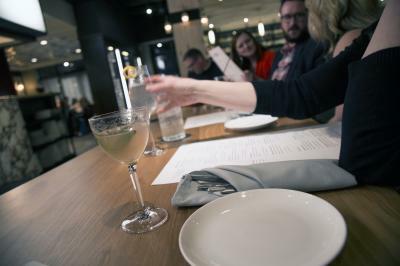 On packed nights, though, (and nearly every night since its reopening has been packed), the open-concept space can teeter towards the louder side of a dining experience. So it's worth keeping expectations of a quiet conversation in a 200-person capacity space low. Expectations of the food, however, are easily placed high, accelerated by the I'm-not-in-Erie-anymore cosmopolitan feel with a near-straight sightline to the kitchen, where one can bear witness to the flame and fury of the cooks at work from most vantage points. Let's start with the entrées. 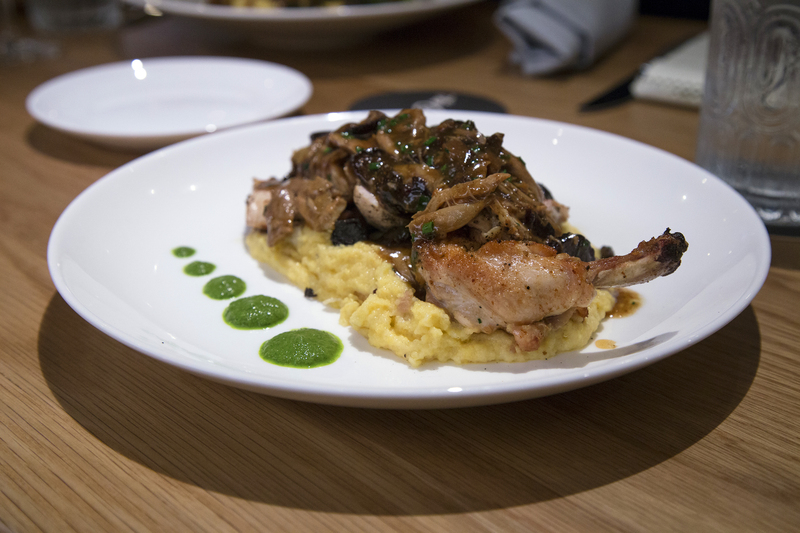 One of the new menu standouts is the Organic Poulet Rouge Chicken, which spotlights succulent poultry in a brandied fig pan sauce upon a savory pillow of bacon-brie polenta, rounded out with wild mushrooms and rapini puree. "If it ain't broke, don't fix it" applies to the Boar Osso Buco, a welcomed return of an old friend whose company gets better with each visit. Hearty is an understatement of the heaping hunk of braised meat lathered in a butternut squash, red onion marmalade pan jus and paired with bacon-laced brie polenta and flash-fried Brussels sprouts. Another standout on the current menu (some things will change on the spring menu) is the new Organic Poulet Rouge Chicken. Too often considered a lesser selection for meat when dining out, chicken is dismissed as the thing that tops salads to give them substance or makes a healthier alternative to a burger when grilled and plopped between a bun. Not the case with Executive Chef Joe Perino's take here. With many a good looking entrée to choose from — the Filet Au Poivre, a black angus filet mignon bathed tableside in brandy pan sauce in the sizzling cast iron it's cooked and served in; the buttery deliciousness of the Jumbo Lump Crab Cakes; and others — I told the server when he asked what I'd like to have for dinner, that I wanted the dish the chef was most proud of on the menu. That, as it turns out, is the chicken. And damn proud Executive Chef Perino and RLH Corporate Executive Chef Kristian R. Young should be. The elegant brandied fig pan jus drives the dish forward without overpowering it and with a keen awareness to ensuring the succulent nature of the chicken, both the sous vide breast and the confit of leg. Paired with the aforementioned bacon-laced brie polenta that screams "warm rich comfort food with a delicate attention to the balance of salt, fat, and starch as not to be too heavy," the chicken is rounded out with wild mushrooms and rapini (commonly also known as broccoli rabe) puree for an absolutely charismatic fork-scraping, plate-clearing dish. The Cork 1794's excellently crafted entrées share a bright spotlight with the drink menu. The RLH Manhattan, made with Skunk & Goat Selected Knob Creek 120 Bourbon (as in 120 proof) is deceptively smooth, striking an on-point balance with the Dolin's sweet vermouth and angostura bitters. Smokin' Young Gun is a must-try, with the smokiness of the mescal matched with a black pepper and orange syrup and balanced with the sweetness of brandy and maple syrup going toe-to-toe with the tartness of the apple cider. There's a lot going on in that glass, but its levelness otherwise belies the complexity of the ingredient mix. The wine list is impressive and the staff knowledgeable and helpful in making solid recommendations (I enjoyed the Baileyana "Firepeak" Chardonnay, as recommended by the server, but would add that a dry red, in my preference a Chianti, would complement the bold, saltiness of the brandied fig pan jus and polenta just as well if not better). A nice, short list of rotating craft beers are on tap with a longer bottle list selection. And for those looking to imbibe but without the alcohol, a fun mocktail is worth exploring. But what about the "starters" — you skipped right over them? 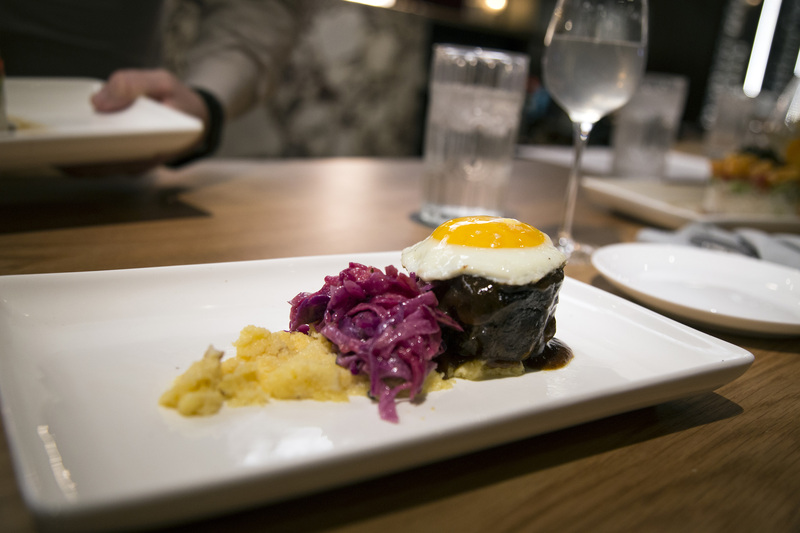 The American Kobe Short Rib is an eye-poppingly-designed plating — five-hour-braised beef topped with a sunny side up egg. But the meat lacked the expected flavor punch one might imagine and it is a calmer dish than it appears to be. Like the short rib, the Sushi Stack is beautifully designed. But its portion size is a bit overwhelming if you're considering moving on to an entrée and possibly dessert. The Hatch Dip — available at other RLH locations, such as Molly Brannigans — is a fine starter, but could be improved by being coupled with housemade tortilla chips or warm, grilled bread. The Red Deer Meatball (which our server pushed hard for us to try but arrived well after the other starters and closer to dinner) lacked the dynamic profile expected from the blending of venison, pork, and veal and could've easily passed for just beef. For what it lacks in presentation, the Seafood Hot Pot offered a zest that matched its aroma when it arrived at the table. The diablo sauce offers enough smack and heat to draw sweat on your brow but not too much to leave you crying, creating a great multiple-sense experience. At the opposite end of the menu, of the desserts sampled, the Cloud Cake stole the show. An airy bite of delectableness, it's saccharine without inducing a sugar coma — and it's fun. Which is a great way to explain the reimagined, relocated, reopened Cork 1794. If possible, it's highly recommended to get reservations at the Chef's Table for even more excitement. While the view fails to provide a direct look at the steaming pots and pans and sizzling grill top, you can still enjoy a front-row experience to the kitchen. And, you might just get a mid-course dish from Chef Perino himself. We enjoyed a dueling plate of a scallop and a bite of lobster. A wonderful surprise was the finger lime (think: lime caviar) pulsating with an acidic citrus profile to match the seafood pair. The lobster was meaty and buttery and wonderful. The scallop may have been the best I've ever eaten. Several others at my table agreed. With Perino in the kitchen, an awesome lineup of entrées, a big-city-like bar program, and room to grow with a rotating offering of starters, The Cork is a welcomed addition to its new home. Here's hoping the Organic Poulet Rouge Chicken gets to become as beloved as the Boar Osso Buco in a place that'll dish out many more successes to come. Ben Speggen can be contacted at bSpeggen@ErieReader.com and you can follow him on Twitter @BenSpeggen.